Hi, Damian Garbus here. 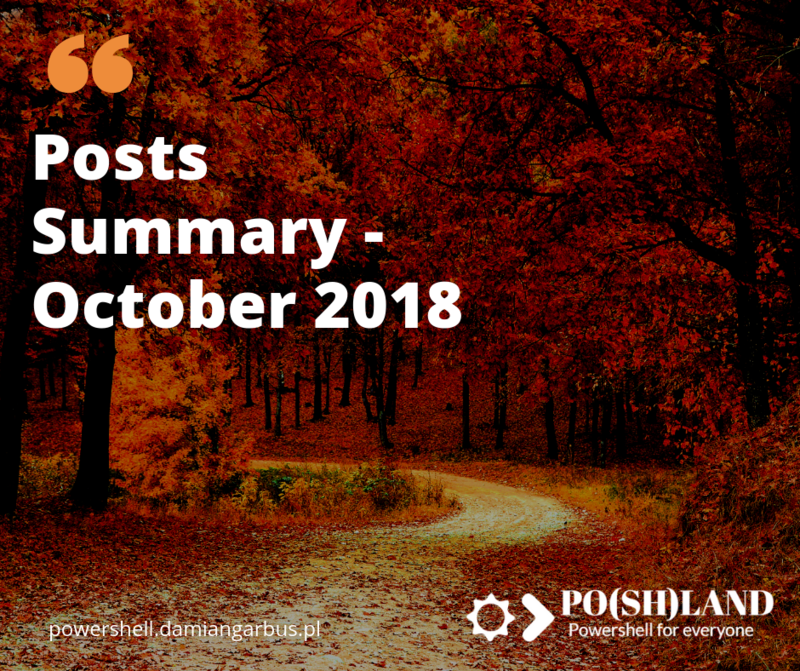 Today is 1st November and it’s time to make a summary of October 2018 powershell posts on my blog. Let’s start. Two months ago I decided that I will be publishing articles twice a week. Now I know that I don’t have time for publishing regularly on Mondays and Thursdays. When I started the blog I had one task – write new powershell posts. Today I have to write new posts too, but also reply for emails, comments and make the blog easier to read. Also, I want to share more Powershell resources like scripts and templates. I wrote 5 posts in October 2018. The four posts show Powershell basics. Also in October, I wrote my first post with a surprise for a reader. It was Powershell script template to run in Task Scheduler. Direct page to download template is here. I decided that Monday will be the best day to publish new posts. Sometimes I will publish on Thursdays but it will be some special posts or month summary. In November I want to make changes on the blog to make it more readable for new users. Please stay with me and give me your feedback on what can I make better. Also please let me know about topics what you want to read on this blog.